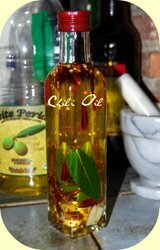 This chili oil is an essential addition to any Mediterranean kitchen store cupboard. You can transform otherwise quite boring meals with a simple shake of the wrist. Add it to - salads, stews, grills, soups, pasta dishes and of course, pizzas. It's simple and easy to make requiring only a minimum amount of time and delivering a fantastic taste experience. Follow the recipe to begin with, but you'll probably want to add some of your own special favorite Mediterranean spices or herbs to make a Mediterranean chili oil that's all yours. You'll need a 250ml/8.45 fl oz bottle with sealable top. 250ml/1 cup of extra virgin olive oil. 6 - 8 Dried chillis roughly bashed. 3 Cloves of garlic halved lengthways. 1 tsp. of Cumin seeds. 1 tsp. of coriander seeds. A 2" stick of cinammon. First sterilize your bottle by placing in a pan of boiling water for 5 minutes. Then leave it to drain until completely dry inside and out. Put all the spices into a pan with the olive oil and bring to the boil. Once boiled - remove from the heat and allow the infusion to cool to room temperature. Now - pour it into the bottle, making sure to spoon in all the spices - you might find it easier to use a funnel. Leave for a couple of days - shaking vigorously each day and then you're ready to use it. What a great idea for a home-made Gift ! !